By the time Katsushika Hokusai painted The Great Wave he was already a celebrity in Japan. The iconic print was produced in 1831 as part of a print series, Thirty-Six Views of Mt Fuji, when the Japanese artist was 71 years old. Within a few years of his death at 89 in 1849, Hokusai’s fame had spread around the world and his most famous work was on its way to becoming, in Christine Guth’s words, a “global icon”. I’ve seen it recently as part of a mural near London’s Old Street, on the prow of a boat in Liverpool docks, and decorating a grime-encrusted car window in south London. It’s tempting to claim that, without Hokusai, there would be no modern art. Manet, Van Gogh and the rest may have started the revolution in France, but they needed Hokusai to break with the stale conventions of representationalism – to realise that one could do more with a two-dimensional surface than simply replicate the world as it is. If so, then we need to understand the terms of the exchange. Guth and others have begun to unpack the problem of demand, the circumstances by which Hokusai’s work spurred an initial – seemingly inexhaustible – desire to see the world in a new way. But we also need to think a bit more about the question of supply – about what Hokusai was able to do and how he was able to do it. A new exhibition at the British Museum gives us an opportunity to do this. Hokusai himself later claimed that The Great Wave came before he had grasped the “true form” of things – by 90, he suggested, he would get closer to the essence of art. The exhibition agrees, focusing on the sublime work he produced in his last two decades. It encourages us to move beyond The Great Wave, looking as closely at his paintings as we have at the prints that have so fascinated us. In order to understand them and him, we need to consider three different aspects of Hokusai’s life and work: society, technique, and thought. First, Hokusai’s art was a product of its time and place, made possible by an extensive social network. Hokusai started out in his teens studying under a leading print designer. In time, he had students of his own, the most important of whom was his daughter, Eijo, herself an accomplished painter. Meanwhile, a woodblock print was a group effort – it required a quartet: artist, block cutter, printer and publisher. But Hokusai also broke with convention. His taking of an “art name” – Hokusai – in 1798 (he was born Tokitarō), was a declaration of independence from the constraints that came with affiliation to a single school. And it was only one of many names he took during his life to mark changes of style, emphasis and interest – scattering old names and seals promiscuously and often making attribution complex. Authenticity is one way to begin thinking about technique. The market would like to know which of the many paintings bearing a Hokusai signature and/or seal were indeed the product of his brush – some may be by his students; some are clearly forged. More challenging is the way in which his practice and work force us to reconsider our assumptions about makers and media. Hokusai drew on an encyclopedic command of Japanese, Chinese and European techniques and styles. It’s difficult to understand his work if we insist on distinct artistic traditions or simple lines of influence. It would also be a mistake to think only about what Hokusai intended. We need to pay close attention to his mastery of craft and the constraints of his materials – the way a brush interacts with paper or silk; the lighting and colouring effects of different pigments; the varying impression of a wood block on a print. Finally, though, if we want to understand the power of Hokusai’s pictures, we need to understand his thought. Hokusai’s world was one in which horizons were local. Travel was slow and usually by foot, interaction with the outside world was highly regulated. But information was abundant – about the Japanese archipelago, about the Chinese continent, and the world beyond. And Hokusai drew on all of this as he pursued his artistic vision. His quest, from his coming of age at the end of the 18th century to his death in the mid-19th, seems to have been increasingly to show how the here and now was linked not only to other times and places, but to the unseen forces by which this world is animated. A few years after his death, this would become more difficult. National boundaries hardened, and nature became an empirical object, observed and classified, and quite distinct from the unverifiable claims of religion. For Hokusai, though, these boundaries were permeable. He sought communion, perhaps – with the gods, who are ever-present in his work; with mythological and historical figures, from China as much as Japan; with the commoners who populate his pictures; and with nature, large and small. He sought to bring the world to life on the page, whether it was a poppy bending in the wind, the mountains and water that surround us, or the unseen forces by which they are animated. The Great Wave, it turns out, includes exact depictions of the mathematical form of two different kinds of water wave, which William Thomson (later Baron Kelvin), then two years old, would go on to analyse. J.M.W. Turner, Hokusai’s contemporary, proved an equally acute observer of the properties of waves. Monet, who studied both, fell considerably short. 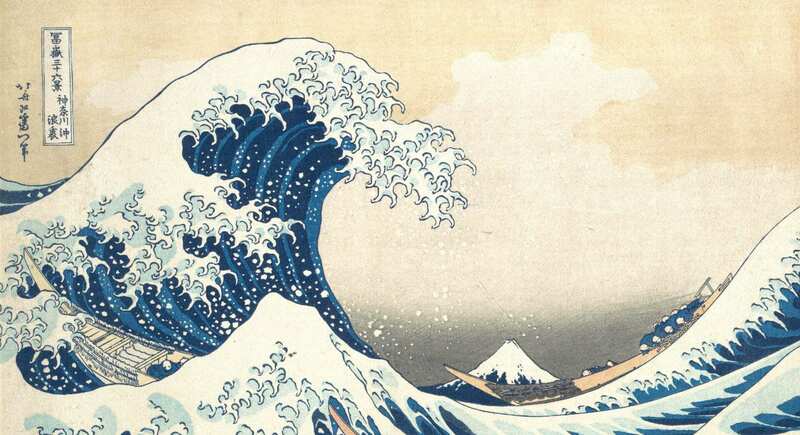 But for Hokusai, the wave and Fuji belonged together, human striving suspended between, dwarfed by the forces of change and the seeming stillness of pure form. Hokusai: beyond the Great Wave, supported by the Mitsubishi Corporation, is at the British Museum until August 13 2017. More information about the exhibition and the events programme can be found here.